Many, many thanks to Alba, Altona, Andrea, Sister Barbara, Celine, Corazon, Francis, Father Hugh Logan, James, José María, Josefita, Julie, Lorna, Lourdes, Lucy, Madeleine, Maria, Maria-Leila, Marie Claire, Michael, Michel, Natalie, Nazar, Paula, Peter, Philip, Randy, Thomas, the Villegas family, Yvonne & Zareth for giving their 'something' about Mary this month. "In the middle of the Hail Mary, there is the word ‘Jesus’, the Word made flesh. He's encased within the words of Scripture, and the words of Tradition, for the Church says, 'Holy Mary, Mother of God, pray for us sinners now and at the hour of our death.' And the rosary has got this wonderful prayer. And if we think about all the history of our salvation, it's all there in the rosary. We are taught by Our Lady to do whatever Jesus tells you, even though it might be silly, like filling jars of water when we need wine. We then say with him, 'Father, not my will but yours', even if it might need the crucifixion. But then there is that promise of resurrection. We will reign with Mary, she will bring us to heaven through the rosary." "Dear children, I am here among you as a mother who desires to help you to come to know the truth. While I lived your life on earth I had knowledge of the truth, and by this alone, a piece of Heaven on earth. That is why I desire the same for you, my children. The Heavenly Father desires pure hearts filled with the knowledge of the truth. He desires for you to love all those whom you meet, because I also love my Son in all of you. This is the beginning of coming to know the truth. Many false truths are being offered to you. You will overcome them with a heart cleansed by fasting, prayer, penance and the Gospel. This is the only truth and it is the truth which my Son left you. You do not need to examine it much. What is asked of you, as I also have done, is to love and to give. My children, if you love, your heart will be a home for my Son and me, and the words of my Son will be the guiding light in your life. My children, I will make use of you, apostles of love, to help all of my children to come to know the truth. My children, I have always prayed for the Church of my Son, and so I also ask the same of you. Pray that your shepherds may come to shine forth with the love of my Son. Thank you." "Our Lady is my mother: very close to me and someone I turn to for any help I need, any advice I want, any troubles that need sorting out, she's the one that is closer to me than anyone." Sister Barbara is from Cornwall in England. "It’s been a very special grace being brought up in a place like Fatima, where Our Lady of Fatima appeared. Everyone that has been at Fatima has surely felt the motherly atmosphere and security, safety, in that place because, well, that's what it was all about: Our Lady being made known by three little humble children." José María is 22 & from Fatima in Portugal; he gives his response in English & Portuguese. "Mary, she means just so much. She's just more than inspiration for all of us. She's the queen of love, the queen of mothers, she's our strength, she's the star." Joséfa is from Fatima in Portugal; she gives her response in English & Portuguese. "John Paul II, when he was elected he was talking to the crowd and he asked to pray to the Holy Mother and he said 'We are going to pray together to our holy mother, Madonna Sanctissima', which is the most holy Mother of the Church. Quando Giovanni Paolo II stata eletto nel 1978, parla alla folla che e in dentro di preghare la Madonna e sono venuti queste due parole 'Madonna Sanctissima'. " Andrea is 29 & from Italy. The Villegas family altogether: "Dios te Salve, María, llena eres de gracia, el Señor está contigo. Bendita tú eres entre todas las mujeres y bendito es el fruto de tu vientre, Jesús. Santa María, Madre de Dios, ruega por nosotros pecadores, ahora y en la hora de nuestra muerte. Amén." Agustin, Ruth, Marta, Jorge & Javier Villegas are from Spain. "Mother Mary, I like her so much, I love her so much." Michel is from France & gives his response in English & French. Thomas is 23 & from the United Kingdom. "I’m very, very fond of Our Lady because I know that I’ve got very strong faith." Father Hugh Logan is a priest of the diocese of St George in Grenada. "Being asked what Mary means for me felt somewhat strange at first as I'd never really stopped to think about it. It's not a question I'd ever been asked; perhaps I should have thought about it? But for me it's not something I felt the need to ponder over. Being asked what she means for you is almost like being asked what my mother or father or best friend means to me. It's one of those things that, like breathing, is part of my every day life. And as a Catholic Christian it's part of my life of prayer and part of my relationship with the Lord." Nazar is 20 & from England. "Holy Mary is the most powerful mistress of all souls. She is so merciful and she rules all over the world .. and I've found out that she is the most merciful of all mothers." "Mary is our mother, Mother of God, our Queen, Mother of the Church, and Mary Most Holy." Lorna is from the Philippines. "I pray every day to Mama Mary." Randy is from the Philippines. teraz i w godzinę śmierci naszej. Amen." Natalie, from Poland, prays the Hail Mary in Polish. 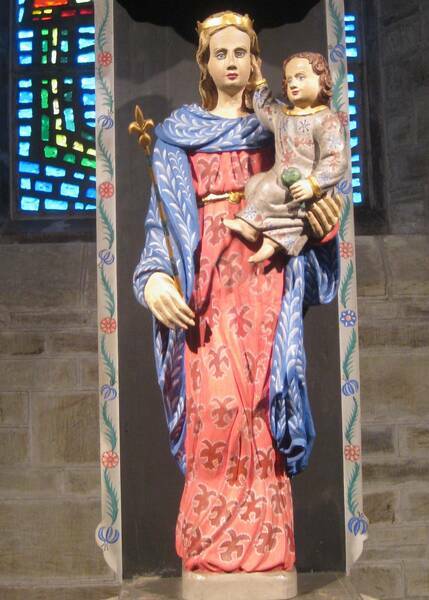 "The Virgin Mary was my guidance since I was a child, and I always venerate her. She has been my helping hand until now and with all my troubles I always go to her." Maria-Leila is from the Philippines. Michael is from Notting Hill in London. "Mary is my mother - the Mother of God and my mother." Alba is from Colombia & gives her response in English & Spanish. 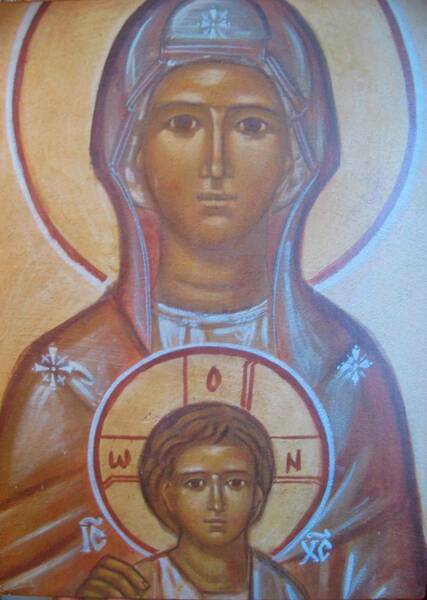 "Mary is the Mother of God and being his mother she's also the mother of all of us. For me, she's key in my life. She drives my life, she tells me where I have to be, how to do my thing. She taught Jesus and so she tries to teach us. That's Mary. Mary is love." Paula is from Spain & gives her response in English & Spanish. "Mary is everything for me, Mama Mary is very kind to me." Lourdes is from the Philippines. “Queridos hijos! También hoy los invito a vivir en oración su vocación. Ahora más que nunca, Satanás quiere sofocar, con su viento contagioso de odio y de inquietud, al hombre y su alma. En muchos corazones no hay alegría porque no está Dios ni la oración. El odio y la guerra crecen día a día. Los invito, hijitos, a empezar de nuevo con entusiasmo el camino de la santidad y del amor, porque por eso yo he venido entre ustedes. Juntos, seamos amor y perdón para todos aquellos que solo saben y quieren amar con el amor humano, y no con el inmenso amor de Dios al cual Él los invita. Hijitos, que la esperanza en un mañana mejor esté siempre en su corazón. Gracias por haber respondido a mi llamado." "My wife is Martha and we’re both Catholics and we’re devoted to Our Lady. We pray to her for her help and we receive it and we are thankful." "For me, Mary is a big helper and I always can go ask her about everything. When I’m happy, when I’m sad, I’ve got a big friend." Altona is from Poland & gives her response in English & Polish. "Part of my morning prayer is ‘Mary, dear mother, help me to live in communion with Jesus today.'" "For me the Virgin Mary is always there to listen to whatever plea I have in my life - my hardships and my joys. So for she's always there like my earth mother, so that's how important Mary is to me as a person and as a Catholic." Zareth, from the Philippines, gives her response in English & Tagalog.